I recently read the Bitterwood quartet by James Maxey on recommendation by another speculative fiction author (Alethea Kontis) and picked it up for a steal (it's currently still a steal). I've included a review of Bitterwood below, but first I want to let you know about James Maxey's newly completed series that I can't wait to read! Cinder, the 4th book in the series, just came out, and you can get the complete quartet here. And, oh my gosh, that cover! I noticed the author's announcement on facebook because of the cover. I see so many things on my social networks that sometimes I accidentally keep scrolling, but this one really grabbed me. The cover is by Hugo award-winning artist Julie Dillon. So, if you've gone and read Maxey's post linked above, you already know that Dragon Apocalypse has a different, lighter feel than Bitterwood. 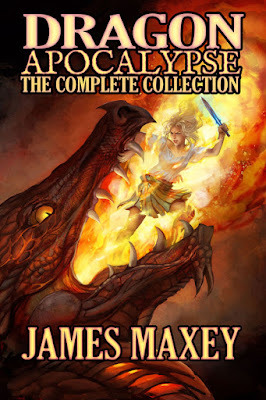 Even so, it was Maxey's great plot and world development in Bitterwood that makes me so excited to read Dragon Apocalypse. If you do not like anti-heros and other dark tones, you'll still want to check out Dragon Apocalypse. The Bitterwood quartet by James Maxey is a complex speculative fiction tale of bitterness and revenge that at first presents itself as a dark fantasy. The narrative draws back proverbial veils throughout the quartet, in the end revealing a deep history in an expansive post-apocalyptic, SF world. Maxey weaves plot in a way that makes big things happen in an otherwise small and petty world inhabited mostly by small and petty people. Many of the characters present as anti-hero to begin with and change their alliances throughout the series. The combination of high-tech and complex characters makes for a thrilling plot that takes unexpected turns. Although I was drawn in from the start, it took me longer before I could appreciate the characters. Jandra in particular started as a seemingly flat character – a flatness brought on by her sheltered upbringing – but in time she grew to become a character that I enjoyed. Antagonists such as Blasphet grow alongside the protagonists, a dynamic that, along with the complicated world, allows the story to explore many themes and subplots appropriate to a SF quartet patterned after epic fantasy. The bad guys (and sometimes the good guys) offer up plenty of deception and misuse of religion that go along with the many layers of the history and world of Bitterwood. 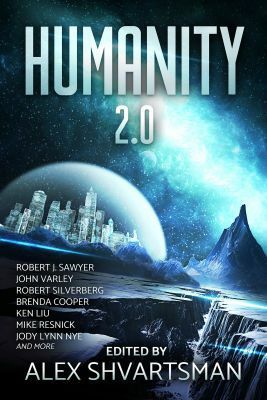 Alex Shvartsman brings us another excellent anthology with Humanity 2.0, a collection of stories that explore how interstellar flight might alter the path of humanity. Fifteen diverse stories show what it means to be human in the future — often the far future, and sometimes with genetic code that no longer reads as homo sapiens. With Humanity 2.0, Alex Shvartsman once again shows that he knows how to pick ‘em and how to arrange them, so that each story compliments the preceding and the following in an even mix of reprints and new fiction. Humanity 2.0 opens with excellent mixed narrative“The Waves” by Ken Liu, whichs asks readers to compare ancient origin myths with the high-tech life of the far-flung future. The theme of the issue begs an examination of topics such as multi-generational colonization and each author brings their own perspective and flare to Humanity 2.0. In "The Right Place to Start a Family" by Caroline M. Yoachim, Yuna ditches crowded Earth to colonize a distant planet and soon discovers that her expectations are rigid and unrealistic. "A Lack of Congenial Solutions" by Kenneth Schneyer presents a philosophical bent that takes a darker turn when enslaved races overthrow humanity. And if you like your fiction even darker, Cat Rambo has you covered in “Angry Rose’s Lament,”a piece where a recovering addict feels he must pull off his negotiation with the wasp-like Solin aliens, or else he and his colleagues will fall back into temptation. "The Hand on the Cradle" by Brenda Cooper deals with themes of abuse and discrimination when cyborg Colorima is tortured for her supposed knowledge of her colleague’s radical resistance movement. "EH" by Alvaro Zinos-Amaro takes creepy to a whole new level when humans jump at the chance to become enhanced and then discount the side-affects of their genetic alterations. In the middle of the anthology, “An Endless Series of Doors” by David Walton shows the pros and cons of portal travel and of the human condition by telling an adventure from the perspective of a hopelessly selfish, ultra-rich party-goer. Towards the end, Mike Resnick brings us a powerful, multifaceted story with "The Homecoming," in which Jordan resents his son Phillip for taking on the form of an alien and leaving Earth. When Phillip returns home for a visit, he discovers his mother in the advanced stages of Alzheimer's. For more stories on the lighter side, body modder Niko takes readers on an adventure on the lam in "Green Girl Blues" by Martin L. Shoemaker. "Star Light, Star Bright" by Robert J. Sawyer ends the anthology with a sweet exploration story full of hope. Humanity 2.0 releases Nov. 24th, 2016 from Pheonix Pick. Pre-order Humanity 2.0 at [ Amazon ] to get your copy delivered Nov. 24th! Visit https://alexshvartsman.com/ to see Shvartsman’s many anthologies and short story publications.